NEW YORK (CNNMoney.com) -- Economists generally aren't worried about the U.S. or global economy falling into another recession. Looking at the bond market, many investors don't agree. The yields on long-term U.S. Treasurys, such as the benchmark 10-year bond, have tumbled sharply over the last six weeks, hitting as low as 3.1% in early trading Friday before they rebounded to 3.2% late in the day. Some experts say this is a sign a lot of major investors are betting on tough times ahead. "There is big money making big bets that at a minimum we we'll have a recession if not a depression that could last for years," said Kevin Giddis, managing director of fixed income at Morgan Keegan. "It's a scary scenario to subscribe to, but that's the current one being batted around." It's not a theory that Giddis agrees with; he believes the U.S. economic recovery is strong enough to withstand any problems with Greek debt and the euro. But he thinks that the market has been too spooked by fears of another economic downturn. He believes the trading has moved beyond the typical flight-to-quality that can drive down bond yields and drive up bond prices at times of uncertainty. "There's a risk aversion trade and a fear trade, but we've taken this to a level on steroids," he said. In early April as the U.S. economy was posting signs of growth and the fears were that it would lead to inflation down the road, bond yields started to rise, as they typically do in such an economic environment. 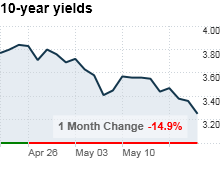 The yield on the 10-year closed at just under 4% on April 5, the highest level since just before the crisis in financial markets started in August 2008. If anything, some economists were worried that rates were starting to rise to levels that could choke off signs of a rebound in housing. With the Federal Reserve having completed its purchase of $1.25 trillion in mortgages, the rate on the 30-year fixed rate mortgage rose to 5.21%, the highest level in eight months. China in the mix too: Other bond experts say it's tough to draw the line between fears of the unknown and fears of an economic downturn. They say it's not just Europe raising fears of a slowdown. Moves by the People's Bank of China to tighten credit to slow growth there, and the uncertainty of whether financial regulatory reform moving towards final passage in Congress could slow lending and growth here have combined to raise new fears about the economy. "It's just a fear that the combination of all these factors could result in, if not a double dip recession, then a recovery that will be quite slow," said Kim Rupert, fixed income analyst at Action Economics. The fact that this week's inflation reports showed prices in check and that other markets show prices for commodities, like oil, falling, also are feeding into the lower bond yields. But few experts believe that the more benign outlook on inflation is lowering bond yields by itself. The drop in bond yields does have its silver linings. Mortgage rates have followed the bond yields lower, down to 4.84% in the most recent reading. Lower bond yields helps reduce the government's cost of borrowing, an important savings in a time of rising budget deficits. And those who have invested in bonds have seen the value of their funds rise with the prices that move in the opposite direction. The run-up in bond prices, and the drop in yields, may not be over, according to the experts. "It could very be we're one more shock away from breaking the 3% level," said David Coard, head of fixed-income sales and trading at the Williams Capital Group. But he said that there is also a risk that bond yields could start to rise quickly, which would cause its own problem by raising the cost of borrowing for home buyers and the federal government. "We moved a long way in a short period of time, no reason we can't see the reverse of that if a sense of comfort develops and confidence is restored."